Rivalry week games are in full swing with some great action on the fields so far on this Saturday, so it is time to stop down and review this morning’s College Gameday. 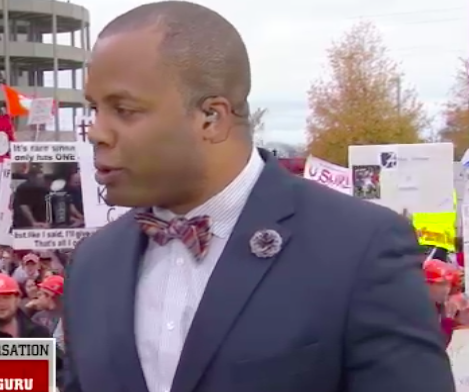 This edition of College Gameday was broadcasting to your television set from Tuscaloosa, Alabama for the legendary Iron Bowl game between Alabama and Auburn. The rest of the rivalry week game slate is nearly that impressive all the way around, so this week’s show was very football intensive and short on nonsense. The Gameday crew opened up the show with their quick hit segment advertising the ESPN network games of the day, and was then followed by the re-emergence of the mysterious entity known as Babi Mac. Ms. Mac was featured while entertaining the crowd after coming back from the first commercial break, but was completely obstructed from view by the cameraman who chose to record her appearance with a trophy and a pole in the way. 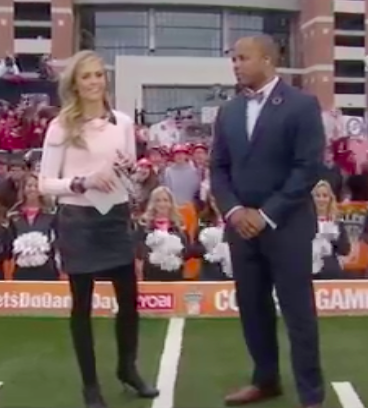 There was an appearance by QB guru George Whitfield to discuss Marcus Mariota with Sam Ponder. It appears that in Whitfield’s spare time he may also be joining the Nation of Islam with this week’s outfit. I do have to admit, his suit fit much better this week and it was much less outlandish on the patters. Please note the teeny tiny lapel rosette for your enjoyment. Signs this week were pretty disappointing. 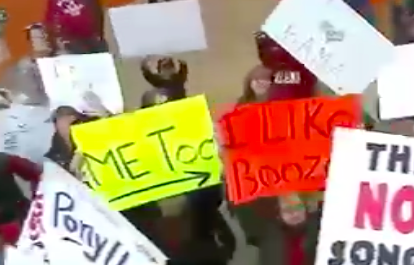 It was quite a large crowd this week with tons of signs, so I’m sure we missed something good, but it was slim pickings to find gold this week. For that reason, we will highlight the most crude sign of the week, as well as the biggest giveup of a sign this week. While we are looking at Kirk’s handsome mug above, please take note that he is not wearing a lapel rosette this week. Our public relations department attempted to contact his people for an official statement regarding the lapel rosettes he has been wearing recently, but they declided to comment on his behalf. Or maybe I tweeted at him and he never responded. Jerk. 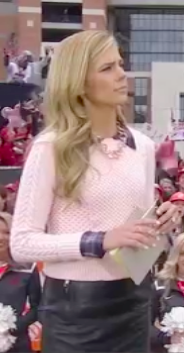 While we are on the topic of fashion, let’s stop down to review the Sam Ponder Outfit of the Week! This week she was wearing a nice knit sweater with a black skirt and leggings. Jennifer complimented the skirt and sweater combo as well as the jewelry, calling it all around “a good look”. Sam Ponder, if you are reading this for some reason, just remember your biggest fan is waiting for a shoutout @GamedayJen. Gene W. had a piece covering last year’s Iron Bowl and some of the quirkier aspects you may not have known about. The segment featured the team’s equipment manager Dana Marquez, who sewed together a torn jersey on the sideline late in the game rather than use a spare, because a new jersey might jinx the game. Apparently the field crew discovered that after the field was rushed last year, someone scattered a person’s ashes on the field perhaps in accordance with their last wishes. The main focus was on Auburn student Hayden Hart, who stole Gus Malzahn’s visor after the game last year. They were reunited this year when Gus met Hayden and offered to sign the visor for him. Nick Saban joined the crew to discuss football items. I know he may have a reputation of being stoic, but I am predicting he will end up as an ESPN mainstay whenever he decides to call it quits at Alabama. When it came time to pick the games, this week’s special guest picker was none other than Alabama legend, wearer of fur coats, and best friend of Suzy Kolber, the man known as Joe Namath. He seemed in great spirits and sobriety this morning as he picked the slate of games today. 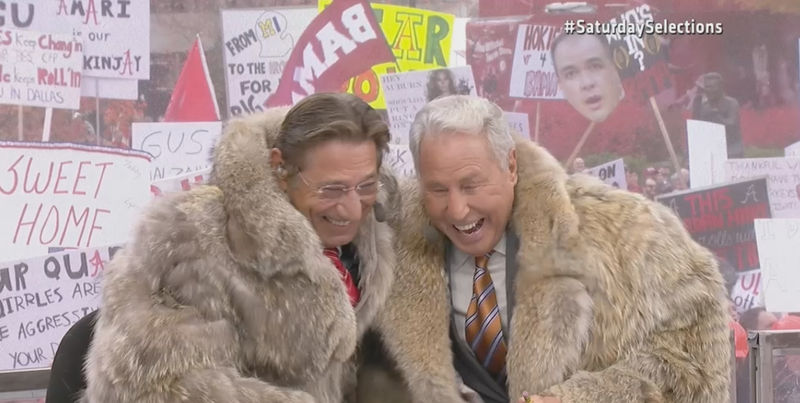 On set, both Namath and Corso manifested themselves a pair of fur coats to wear while picking games. 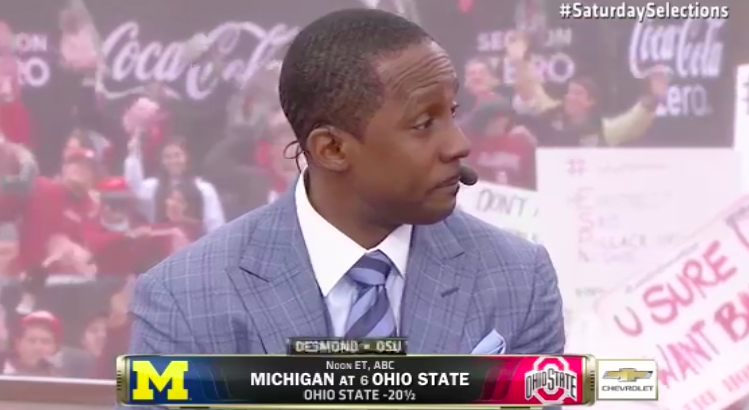 In this week’s edition of “Desmond Howard picking the Michigan game”, a dejected Desmond Howard said his Wolverines would fight hard but that it just wouldn’t be enough to overcome the Ohio State Buckeyes this year. I may have seen a single tear roll down his cheek, but this is unconfirmed. For this week’s big game, David, Desmond and Kirk were unanimous that Alabama would win today’s big game. Joe Namath too went with his Crimson Tide. 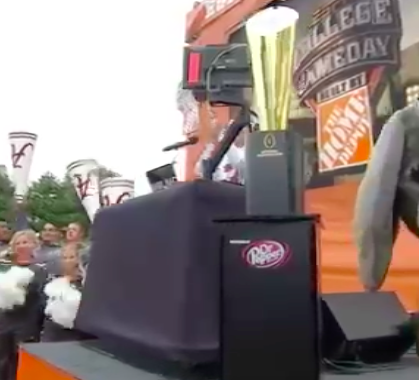 Lee Corso goaded the crowd, saying that he picked Alabama the previous year and was let down. Just when you thought he was going to pull the trigger on Auburn, he faked us out and threw that elephant headgear on for another Alabama pick. 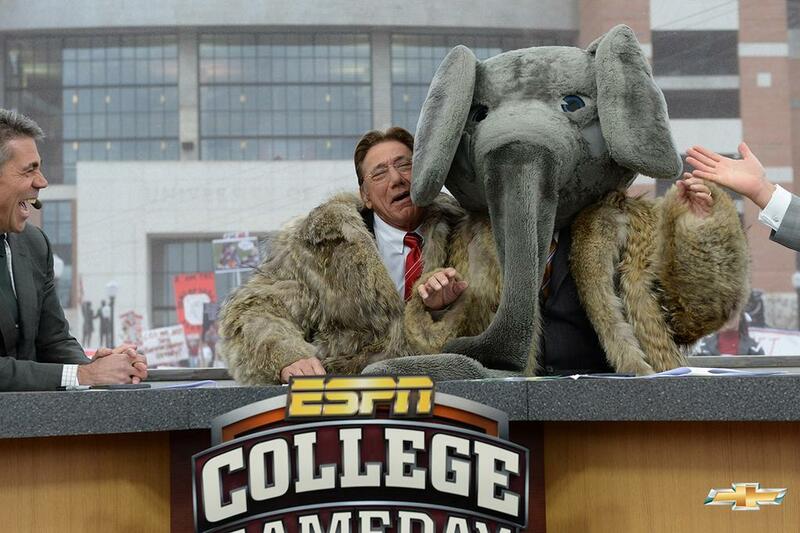 Now my memory may be a little bit hazy, but I’m pretty sure that in my Gameday season preview back in August I predicted at some point we would see Lee Corso and Joe Namath wearing matching fur coats while Corso donned an elephant mascot head. 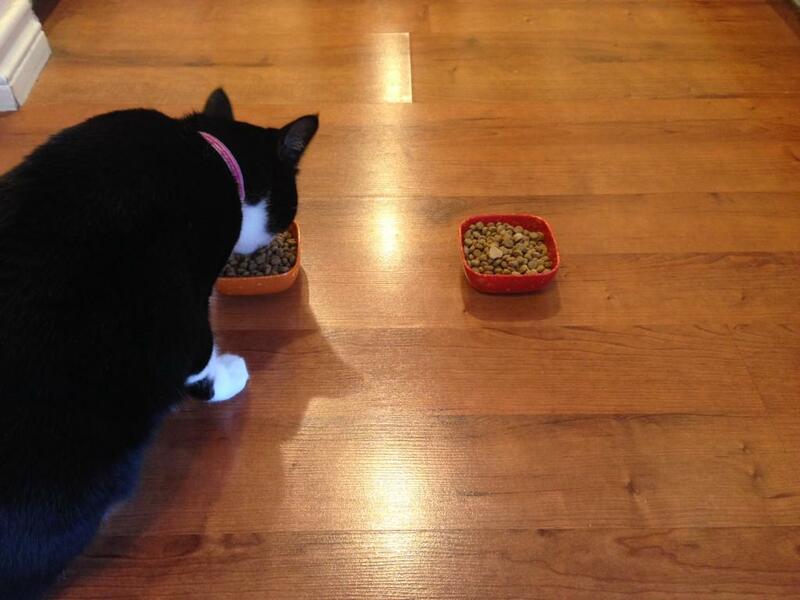 Anyways, Charley the Cat did a triple fake-out before picking Auburn to beat Alabama this morning, so we are looking for a showdown between Charley and Corso tonight. The BCS championship game is coming upon us very quickly. If you’re here to look for picks, then you are either overly concerned with the Arkansas St/Ball St game, or you’re looking for predictions on the championship game. I will be documenting anyone and everyone’s picks I can find for the championship game in this post, so check back often if you want the latest updates (things can change drastically leading up to the game; I’m looking in your direction Dr. Lou). Our expert panel below is currently sitting at 27 to 11 in favor of Florida State over Auburn. Take a look below to see how your favorite (or most hated) personality picked the big game! Note: Updated 1/6/14 for your pleasure. The 2013 regular season is in the books, and bowl season is now open. Here is how business will be conducted during bowl season around here. I’ll probably post a weekly update on picks for you, and each update will only have the most recent picks. In other words, if Lou Holtz picks FSU to win the national championship today, but a week from now chooses Auburn, then Auburn will be the official pick. It is only the most recent one which I will be posting, and only the most recent one that counts. I will also document where each pick came from, so if you have heard something different more recently then use your best judgement, mmkay?